1) Why Dane Warren Real Estate compared to Traditional 6% - 7% Commission Real Estate Firms? OR Internet Discount Firms? I am a Full Time CRS Broker with 19 Years of experience which we use to benefit our clients best interest! We have over 3000 Closed Transactions. We use this knowledge to secure the best properties and best terms on contracts for our buyers and sellers. 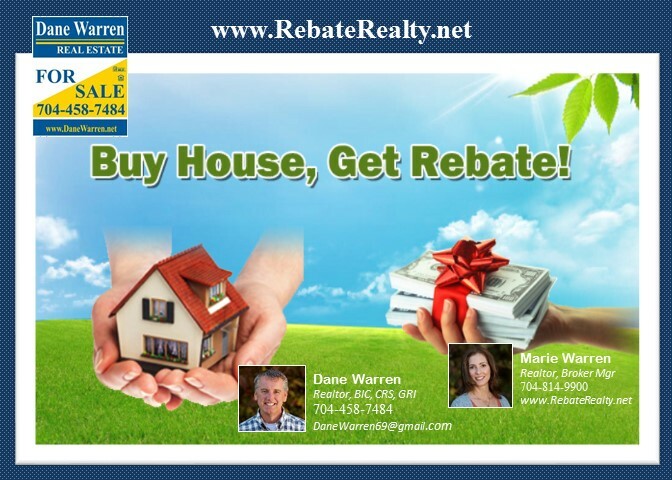 A Seller does not have to pay 7% or 6% in Real Estate Fees with Dane Warren Real Estate. Our lower fees are just the beginning of the financial benefits my clients will receive. Trust friends and family when it comes to a great place to vacation or general location to live. Trust Dane Warren Real Estate when it comes to Buying and Selling Real Estate around Metro Charlotte. Call or Visit our Office and speak with one of our 40 Brokers. Beware of Discount Realty Firms as well,, internet or local,, First question to ask,, Do these Brokers even visit the subject property,, if the answer is NO, this is the first Red Flag,, Call us and get the true facts about your property value and the best way to market your home. 2) How does Dane Warren Real Estate provide “listing to closing” services? Dane Warren will post your home in the Charlotte Metro MLS System, which allows your home to be put into the Internet Data Exchange Portal. Your home will be advertised with up to 24 photos and on over 2500 web sites using IDX/MLS/Realtor.com and Zillow.com. Dane Warren will provide pricing analysis to meet current market conditions that will take into consideration the homeowners timeline to sell their home. A photo shoot will be setup to ensure the best 24 photos are used to post into the MLS system. We will secure the best terms during the offer to purchase phase and manage potential inspection issues the buyer or inspector may find. Our full time professional closing broker will manage the closing process with the least amount of stress to our clients. 3) Why is Dane Warren Real Estate Inc., successful in the Metro Charlotte and surrounding areas? a) We provide our clients the best in marketing and understand the local residential market conditions. c) Our experience has prepared us to serve our clients best interest at a levels few brokers and real estate offices ever reach. d) Our referral base grows each year and we choose to remain a mid size firm so we can ensure our brokers are trained with the best instructors to serve our clients best interest. 4) Why do so many people still list with Brokers charging 6%? Firms charging 6% or 7% will promote Fear about less service and marketing when using a Firm like ours, see pass the marketing fear tactic. Many homeowners do not realize commissions are negotiable. Many times homeowners like to hire a trusted friend or family member working part-time (6 or less transactions a year) paying a higher commission. Be caution even when a friend who is a part time Real Estate wants to list your home. Trust is important but hire a Broker with experience who you trust and your bottom line will be rewarded and stress kept low. 5) Why do I need an agent at all? Not many of us pull out our own teeth or set our own broken bones. Some folks may not want but probably do need a professional Real Estate Broker. The main reason so many sellers use Dane Warren Real Estate Inc., is for our experience and marketing. We counsel you on pricing your home, marketing your home, and most important, negotiating the best terms for you and managing your transaction throughout the closing process. We like to make sure our clients are prepared for closing by eliminating unnecessary stress when buying or selling. 6) Do we also represent buyers? 7) Why aren’t other brokers offering lower fees? Traditional real estate brokerage is entrenched and change is slow. The Internet has helped to speed up the old school way of providing service to buyers and sellers as well as property management. Dane Warren Real Estate has always offered lower fees in the Metro Charlotte market and now notice a number of discount firms following our pricing models. Beware of internet Brokers without boots on the ground in Metro Charlotte. 8) Do you provide a CMA or SMA? Yes, we provide you a Selling Market Analysis that will give you the best information to price your home within a range that fits your motivation to sell. 9) Will my MLS listing look the same as larger local and national real estate firms? Yes and in fact our clients find that our photos and presentation looks better in the MLS system than other local and national real estate offices. Remember looks are very important, pricing is just as important, we fight to get the best terms for our clients. 10) What is Broker Assist Service? A Broker Assist Listing is when our broker does not help with contract negotiation and pricing during the listing with DWRE. Once our client has the contract in hand, our full time closing Broker will assist the seller all the way to the closing table.. We do offer Photo Editing, Showing Service, Sign and Lockbox to help our clients set up their new MLS listing..
11) Will a yard or window sign and lockbox be provided with a Broker Assist Listing? YES and this service will include our MLS Centralize Showing Servcie too. 12) Do buyer agents avoid our Broker Assist listings? No, buyer agents want to see that they are going to be compensated verses an unknown “for sale by owner” Listing service. 13) What should I be aware of when using a Flat Fee MLS Service Provider? a. Be sure your Flat Fee MLS service provider has a local office in your area so they can better service your needs. b. Can your provider upgrade your listing to a Full service listing by meeting with you at your home and provide the service? c. Will your Flat Fee service provider have to refer you to a local real estate firm to upgrade your service? d. Be sure to price your home to compete well in the MLS and provide good photos to enhance your MLS listing. e. Use caution about a Flat Fee MLS Data Entry Brokerage service that takes all their compensation upfront. Most of these Internet Companies are set up to sell you on Standard MLS products. The most important part of any transaction is the experience your Broker has to represent your interest from List to Close. 14) What should I be aware of if I market my home For Sale by Owner? a. Avoid Internet based real estate firms, why take the chance with your home, limited or full service! b. Buyers in many cases may not be able to secure a loan and your home could be off the market for months. c. Advertising your home is very expensive and just because you can does not mean you should. d. When buying, same principle applies, just because you can buy without an experienced agent does not mean you should.